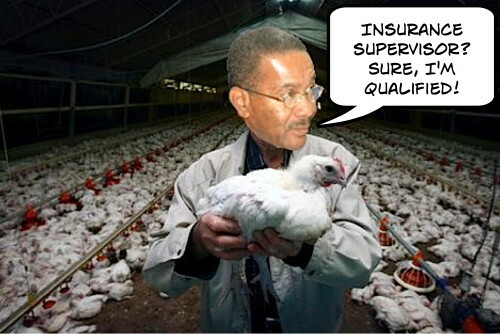 Peter Binose: How deep does the election fraud go in St. Vincent and the Grenadines? How deep was the election fraud of PM Ralph Gonsalves? How deep did the election fraud reach in our last three elections? We all know about the Red T shirts and bottles of strong rum. Many of us know from first hand observation that it went much deeper than that. People were given roofing and building materials. It was actually delivered to their homes, and in many cases they were given tickets to go and collect lumber and other materials from the government small works yard at Arnos Vale adjacent to the airport runway. Much was state owned materials. Delivery was made right up to 4am on the mornings of elections. It was claimed that many of the distributed items were for damage caused by certain past storms, but hundreds if not thousands received items when they lost nothing and had no damage. Barbados roadsign shows support for Jamaica’s Dudus Coke! This sign was seen today (Monday May 24 Bank Holiday) on the left-hand side of Collymore Rock Road going towards Wildey from Bridgetown. Although badly painted, it was built as a stand up sign. For those who might not know (and I am sure you are all aware at Barbados Free Press) Dudus is the man behind the mass confusion and turmoil that Jamaica is in at the moment. Should we in Barbados be worried about this show of solidarity with a known criminal wanted by the US so badly that his case has brought a whole island to almost a standstill and that has law-abiding citizens scared to even breathe? I would like to think that this is a warning of things to come for us because if this is so, the powers that be can take action RIGHT NOW to put such solidarity with common criminals to rest! 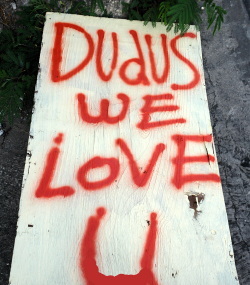 With an e-mail going around about the state of gangs already on the island, it does not augur well to even have one person loving Dudus! And certainly it is an affront to have this sign in full view of people from all walks of life and ages here on our island. I thought you all should know. Perhaps even try to investigate. PS Whilst I usually fear no one…this time I ask that my name and e-mail address be kept out of the newspapers for my own security. And that says something! “I think part of what’s hampered advancement in Africa is that for many years we’ve made excuses about corruption or poor governance – that this was somehow the consequence of neo-colonialism, or the West has been oppressive, or racism,” Mr. Obama told an African website, AllAfrica , in his only interview dedicated to Africa before his visit. The Obama Cat Is Amongst The Pigeons! You really must read the go to YouTube or All Africa.com and let President Obama speak for himself. Read the transcript of the interview or hear him speak on YouTube. The man has ideas, presence and moral authority unlike any USA President I’ve ever seen. I think that Barack Obama would have a most interesting conversation with George Ayittey and Dambisa Moyo. As I have said before… Darn, I like Obama… if he would only soften the US position on Barbados offshore banking and our “tax haven” status.